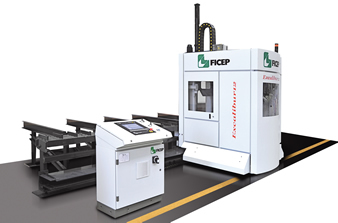 The Ficep Excalibur 12 which was introduced in 2010 is uniquely different than all other single spindle CNC drill lines previously engineered by Ficep since the first units in the 70's. A non-contact laser is incorporate into the vertical clamp to establish the physical location of the web surface. Our wireless remote control system eliminates up to 30% of the operators movements as he does not constantly have to walk up to 60 ft. in each direction just to start the process on the next section. 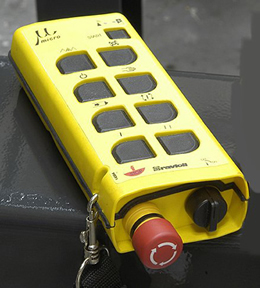 In addition the operator always has access to the emergency stop on his wireless remote to assure safe operation. This system is equipped, as standard, with a six-position automatic tool changer to not only facilitate different holes size requirements but such applications as scribing, countersinking, milling for slotted holes and tapping. The proprietary Ficep software automatically determines when a tool is dull and changes this automatically to a re-sharpened tool. 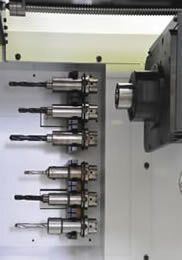 Requires less than one-half the space of a conventional CNC drill line. The value of the investment is less than half that of a multiple spindle drilling line. 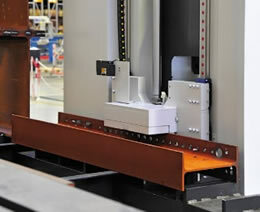 Wireless remote control enhances the operator's productivity by 30% over designs without this feature! The non contact laser probing system accurately locates the flange holes relative to the web without any time loss to probe the web surface! The Excalibur 12 features a Windows based CNC control for ease of operator familiarity and the ability for our tech support group to assist the operator or remotely troubleshoot a problem should it develop. The monthly cost to purchase this CNC line is traditionally less than the cost of a layout man with benefits! Typically the payback is one year or less! This new product line features an exclusive secondary "X" axis with improved accuracy and productivity as it is not necessary to unclamp, reposition and re-clamp for each "X" axis (length axis) movement. This capability also permits scribing on all four surfaces to eliminate all manual layout which can be automatically imported from such CAD systems as SDS2 or Tekla. 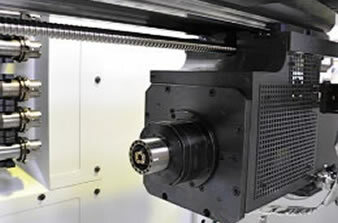 The secondary axis also provides the ability to generate slotted holes, copes and large holes that exceed the maximum capability of the Excalibur 12. The Excalibur is also furnished with a ball screw spindle feed that features 25 HP direct drive spindle that delivers this power directly to the tool as there is no power loss from outdated transmission designs. In addition to the 25 HP at the tool the system generates up to 3,000 RPM to use carbide tools to their maximum capability. Volume Comparison Calculator - What Volume could I achieve with The Excalibur 12? Maximum hole size 1-9/16" 1-11/16"
Maximum section depth 39 3/8" 47"
to change specifications and features from those indicated above. Current specifications and features are part of the formal quotation. 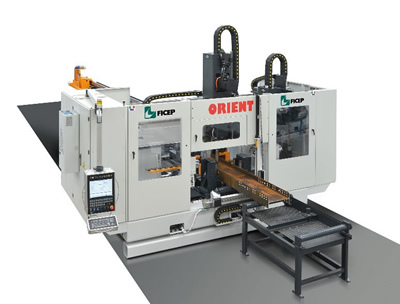 The Orient 12 Model 1201 DD CNC drill line processes material in a conventional fashion as the sections are positioned automatically to the required length dimension along the infeed and outfeed conveyor. The single or dual spindles of the 1201 DD automatically rotate up to a full 180° in less than one second to accommodate any hole requirements in either flange or the web. 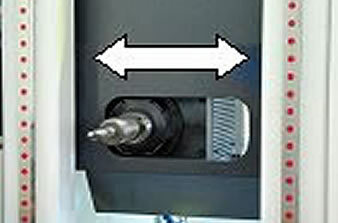 The Orient can also be furnished with a sub axis for the drill spindle. Typical hole patterns, scribing, slotting and milling can be accomplished without the need to move the section. Maximum hole size 1-9/16"" 1-9/16"" 2"
Maximum section depth 24" 48" 78"
The sub axis can be used to perform such operation as scribing, milling of large holes, etc., without the need to move the beam for optimum efficiency.